1010 is the first of its kind in New Delhi. The brand DNA and philosophy is simple and straightforward- luxurious and indulgent pampering at affordable prices. We aim to set industry benchmarks in every element of nail care and grooming. Every visit to 1010 is a pleasurable experience. We strive only for the best and focus on delivering hygiene, safety and services of the highest standards. Working closely with key beauty partners including OPI and Ciate,we offer a host of treatments, therapies and enhancements for nails to ensure we cater to all our clients. We provide ongoing training to our staff so that we can continually develop new and exciting products and treatments that deliver visible results. 1010 will be expanding very soon with several locations to become one of the most trusted names in the country’s beauty business, committing to excellence and deliver through the highest quality products and customer well being. It strives to be an organization making a positive impact on the community at large and continue to develop new and exciting treatments. 1010 will initially open its own spas and later expand through the franchise route. 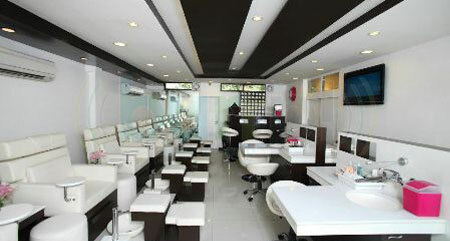 1010 The Nail Spa is an L&H Venture a company that is currently based out of Singapore and The Middle East. CO-Founder and driving force of 1010 �?Tina Narula is a Singaporean entrepreneur who recently moved to India. Having graduated from King’s College London, she moved to Dubai to pursue a career and gain experience in hospitality with one of the biggest groups in the Middle East, Emaar. Making frequent trips to India to explore the service industry, she spotted a gap for premium grooming concepts that led to 1010. Flagship 1010 spa is located in Meharchand Market, Lodhi Colony New Delhi. Disclaimer © 2012 - 2016 L&H Ventures Pvt. Ltd.